Dan Marino was starting his 145th straight game, the NFL record for a quarterback at the time (if not counting strike games with replacement players in 1987), as the Miami Dolphins faced the Cleveland Browns on October 10, 1993. A prolific passer to go along with his durability, Marino was approaching major career records (he came into the game just 45 TD passes behind Fran Tarkenton’s record of 342, for instance) and was off to another fine start in ’93. Head Coach Don Shula’s Dolphins were 3-1, although there were concerns regarding Miami’s defense, which was having injury problems. DE Marco Coleman and DE/LB David Griggs, two of the most effective pass rushers, were out for the game at Cleveland. The Browns, coached for the third year by Bill Belichick, were also 3-1 but having problems on offense. Veteran QB Bernie Kosar was having trouble moving the team and, in each of the previous two games, backup Vinny Testaverde, obtained after six seasons in Tampa Bay, had relieved him. The crowd in attendance at Municipal Stadium numbered 78,138 and they saw the Browns take the opening kickoff and drive 74 yards in eight plays, highlighted by WR Michael Jackson tossing a 16-yard pass to RB Eric Metcalf on a fake reverse. Jackson was in turn the recipient of a 14-yard touchdown pass from Kosar as Cleveland took the early lead. Cleveland’s offense reverted to form and the teams traded punts until, early in the second quarter, Marino passed the Dolphins into Cleveland territory and Pete Stoyanovich kicked a 52-yard field goal. The Browns went three-and-out on their next series and Miami responded with a 10-play, 63-yard scoring drive. Marino completed all six of his passes, with two of them converting third downs, and connected with WR Mark Ingram for a 13-yard TD. Stoyanovich added the PAT and the Dolphins were ahead by 10-7. Cleveland’s next series ended when Metcalf fumbled after catching a pass and CB Bruce Alexander recovered for the Dolphins. Marino again moved the Miami offense efficiently down the field, starting off with passes covering 15 yards to TE Keith Jackson and 17 yards to WR Irving Fryar. But after another short completion, Marino was sacked and, on the next play, was injured as he planted his right foot while throwing a pass to RB Terry Kirby and had to be helped off the field. While it was not yet known, he would not return again in 1993. Backup QB Scott Mitchell (pictured at top), a lefthander who had thrown a total of eight passes over the course of the previous three seasons, came into the game for the Dolphins with his team at the Cleveland 10. It did not seem promising for Miami when his first pass was intercepted by CB Najee Mustafaa and returned 97 yards for a touchdown, setting a new franchise record. The Browns took a 14-10 lead into halftime. The teams traded punts to start the third quarter. On their second series, the Dolphins moved 60 yards in six plays. Mitchell passed to Fryar for a 30-yard gain to the Cleveland 24 and, three plays later, connected with WR Tony Martin for a 19-yard touchdown. Stoyanovich’s PAT had the visitors up by three points at 17-14. The Browns punted following a short possession and Miami put together another scoring drive, taking 9 plays to go 53 yards. Mitchell completed three passes along the way and had a 16-yard run out of shotgun formation for a first down in a third-and-12 situation. A three-yard pass to Keith Jackson was good for a TD and, following the successful conversion, a ten-point lead. It was more than enough for the Dolphins. Their next series, early in the fourth quarter, ended with a failed 36-yard Stoyanovich field goal attempt. The Browns, now with Vinny Testaverde in the game at quarterback, drove to the Miami 22 but Matt Stover was wide on a 39-yard field goal try. Following a punt by the Dolphins, Cleveland again mounted a threat but, reaching the Miami nine, Testaverde threw a pass that was intercepted by DB Chris Green and effectively sealed the game for Miami. The Dolphins won by a final score of 24-14. Miami easily outgained the Browns (338 yards to 202) and had more first downs (20 to 16). The Dolphins also recorded six sacks, to just one by Cleveland. The Browns turned the ball over twice, to one suffered by the Miami – although it was a spectacular one. 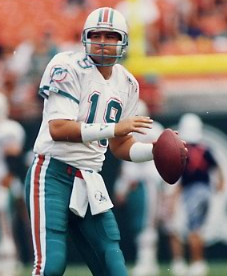 Before his injury, Dan Marino was having a fine performance as he completed 14 of 19 passes for 161 yards and a touchdown with none intercepted. Scott Mitchell followed up with 10 completions in 16 attempts for 118 yards and two TDs along with the one interception. The running backs Terry Kirby and Keith Byars weren’t very successful running the ball but were the team’s top receivers – Kirby caught 7 passes for 61 yards while gaining just 12 rushing yards on 14 carries and Byars had 5 receptions for 51 yards while running for 26 yards on 8 attempts. For the Browns, Bernie Kosar was successful on 15 of 19 throws, but for only 82 yards and the early TD. In relief, Vinny Testaverde was 6-of-13 for 44 yards with no touchdowns and one interception, and was also sacked five times. Still, he was also the team’s leading rusher with 37 yards on three carries. Eric Metcalf caught 9 passes for 66 yards and ran 7 times for 36 yards. Dan Marino’s injury proved to be a torn Achilles tendon and he was officially done for the season. He reappeared on crutches along the sideline during the second half. Scott Mitchell started the next three games for the Dolphins, which were all wins, before he was sidelined by a shoulder injury. Miami kept winning, including one that made Don Shula the winningest coach in NFL history, and had the NFL’s best record at 9-2 heading into December before the bottom fell out and they lost their remaining games to finish second in the AFC East and out of the playoffs with a 9-7 tally. As for Cleveland, there was also change at quarterback with Vinny Testaverde being named the starter for the following week’s game. The Browns won their next two contests with Testaverde at quarterback but, when he was injured, Kosar returned to the starting lineup, the team lost, and in a shocking move the popular nine-year veteran was released. Todd Philcox started at quarterback until Testaverde was able to come back and the Browns won only twice more all season to place third in the AFC Central with a 7-9 record. Scott Mitchell ended up completing 57.1 percent of his 233 passes for 1773 yards with 12 touchdowns and 8 interceptions. It was enough to draw the interest of teams looking for a potential upgrade at quarterback and he signed a big contract to play for the Detroit Lions in 1994.